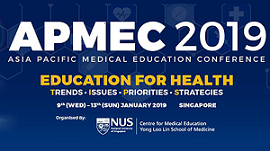 Dr. Shivasakthy Manivasakan, Deputy Director, Centre for Health Professions Education, Sri Balaji Vidyapeeth and Professor, Department of Prosthodontics, Indira Gandhi Institute of Dental Sciences represented Sri Balaji Vidyapeeth at the 16th Asia Pacific Medical Education Conference (APMEC) at National University of Singapore from 10th to 13th January 2019. She was an invited resource person for the post conference workshop on “Enabling educators to deliver authentic curriculum for 21st century learners”. She also presented a short communication on the topic “Trends, Issues, Priorities and Strategies to identify and support the 21st century Health Professions Students Needing Additional Curricular Support – A mixed method study in South India”.